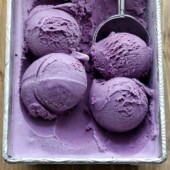 Creamy homemade blueberry ice cream, bursting with flavor! Combine 1/4 cup sugar, blueberries and lemon juice in a small saucepan set over medium heat. Bring to a boil and mash berries. Puree blueberry mixture, then strain through a fine mesh strainer. Set aside. Add 1 cup heavy cream and vanilla to a medium bowl with a mesh strainer set on top. Combine milk, remaining heavy cream, sugar and salt to a medium saucepan set over medium heat. Stir to dissolve sugar. Whisk egg yolks in a small bowl. When milk mixture begins to steam, slowly drizzle 1 cup warm liquid into the yolks, while continuously whisking. Pour egg mixture into sacuepan, followed by blueberry puree. Stir to combine. Continue cooking until mixture coats the back of a wooden spoon or rubber spatula. Pour through mesh strainer into reserved heavy cream. Stir and cool over an ice bath to room temperature. Cover and chill thoroughly, 4-6 hours or overnight. Churn according to manufacturer's directions. Transfer churned ice cream to a freezer safe container. Cover and freeze until solid.